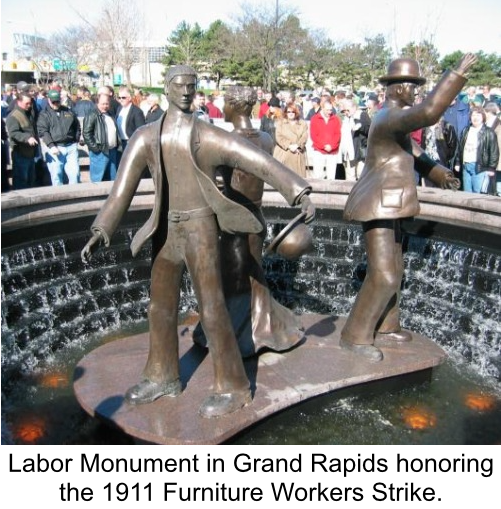 It was 105 years ago this month that workers voted to end the strike against the furniture industry in Grand Rapids. Over 6,000 workers went on strike in April of 1911 against poor wages, long hours and exploitative working conditions. The furniture barons responded by bringing in scab workers from out of town and to engage in a strategy of attrition, by wearing down the workers and holding out against their demands. Bishop Schrembs role is significant on many levels. First, the bishop was invited to be part of a negotiating committee, along with Rev. Alfred Wishart, from Fountain Street Church. Workers had clear demands ast the time, but the furniture barons were unwilling to compromise and diminish their profits. The workers were demanding a 9 hour work day, a 10% increase in wages, the elimination of piecework and the establishment of a minimum wage. Workers also demanded the right to form unions and engage in collective bargaining. At the time, the furniture barons were blacklisting workers who had any sort of union affiliation, which often resulted in their termination from the company. Schrembs himself pushed for the 9 hour work day and also, “asked whether it was fair for employers acting in an association, to deny the right of union to their men.” Schrembs was referring to the Manufacturers Association, which was the dominant business association the furniture barons belonged to. The committee heard testimony from workers in the lobby of the old Livingston Hotel on the corner of Fulton and Division. After hearing testimony from workers over several days the committee then met amongst themselves with the intent of publishing their findings. 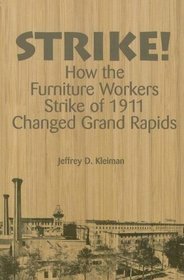 However, the Furniture Manufacturers Association stated on April 18 of 1911, that it would “not deal with workers in any form of collective bargaining.” (Kleiman, Strike: How the Furniture Workers Strike of 1911 Changed Grand Rapids) The workers called for a massive strike the very next day. After several weeks and growing tensions between the industrialists and workers, Bishop Schrembs began to speak out against the injustice being done to the workers. Eventually the mutual aid provided by the unions to striking workers and their families took its tool. On August 19, after 17 weeks of striking, most workers voted to go back to work and thus the strike ended. On August 9, the Christian Reformed Church came out with an official decree that no worker who belonged to the church would be allowed to join a union. 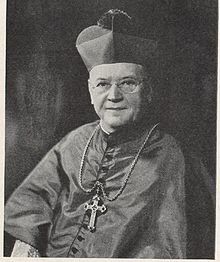 Shortly after the strike ended, Bishop Joseph Schrembs was reassigned to the Toledo, Ohio diocese. There is no hard evidence that Schrembs departure was due to his role in supporting striking workers, but the timing of such a decision suggests otherwise. This entry was posted in Anti-Capitalism/Labor and tagged 1911 Grand Rapids Furniture Workers Strike, Bishop Schrembs, furniture barons in Grand Rapids, labor unions in Grand Rapids. Bookmark the permalink.